Put away the overpriced catalogs, and close the web browsers. This Halloween, there’s no need to spend a lot of money on store-bought costumes. Here are some quick DIY ideas. WASHINGTON — Put away the overpriced catalogs and close out the web browsers. This Halloween, there’s no need to spend a lot of money on store-bought costumes. 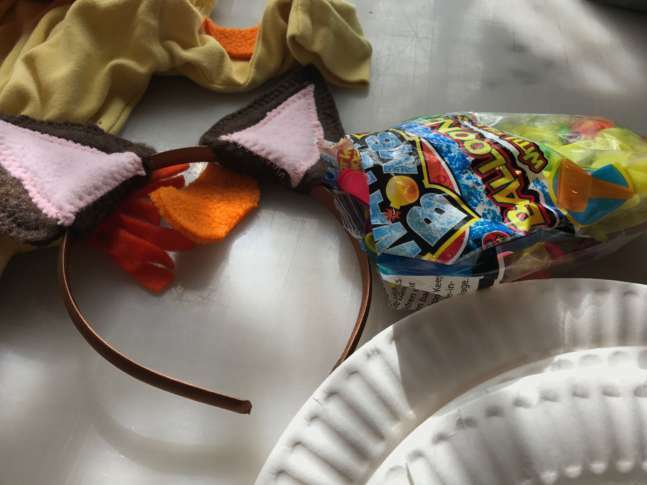 Allison Lince-Bentley, sewing instructor and owner of Tilden House Studio, said making your own costume can be quick, easy and inexpensive. “If you’re a parent raising kids in the D.C. area, you probably don’t have either a lot of money or a lot of time, so I try to focus on ideas that you can achieve without having much of either,” Lince-Bentley said. Best of all, no real sewing skills are required. “As long as you can squeeze a bottle of glue and use a pair of scissors, there are all kinds of things you can do,” she added. Here are some of her best tips — from materials to purchase to ideas to execute — for DIY Halloween costumes. Dreading a trip to a big craft store? Lince-Bentley said you can find almost everything you need to make a costume at the grocery store or drugstore. A good pair of scissors, a bottle of tacky glue and some safety pins will also get you far. “Honestly, I think you can do a $5 costume; I think you can do a $0 costume if you really want to,” Lince-Bentley said. Looking for more ideas? Follow Tilden House Studio on Pinterest.